Good evening. It's a pleasure to join you tonight at the Airports Council International's Joint World Governing and Regional Board Dinner, celebrating excellence in airport management and collaboration. 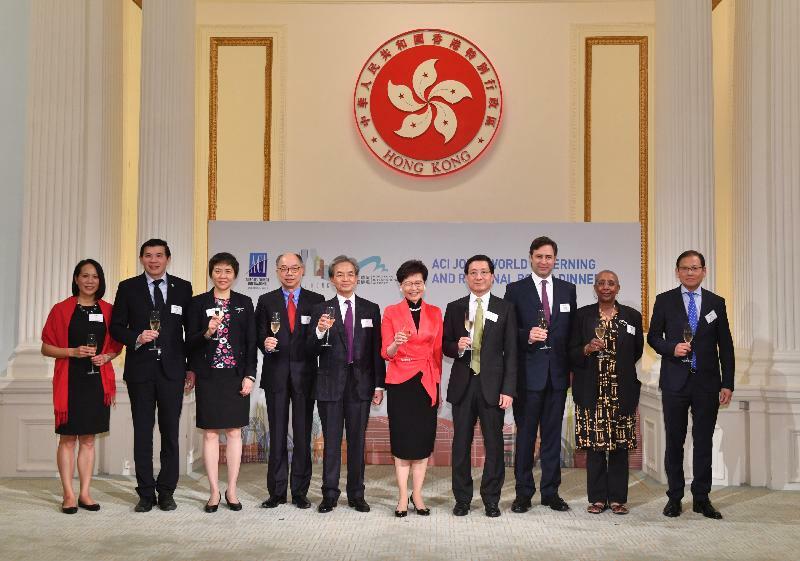 A very warm welcome to Hong Kong, and to Government House. Built in the 1850s, Government House was the formal residence for 25 of Hong Kong's 28 colonial Governors. I've been honoured to call it home since I became Chief Executive of the Hong Kong Special Administrative Region in July 2017. Since taking office, I have opened the doors of Government House and this grand ballroom to events celebrating Hong Kong's successes, ranging from receptions for young Hong Kong students winning awards in overseas competitions to the signing of MOUs with distinguished research institutions to further Hong Kong's R&D. Tonight, I am delighted to welcome to Government House one of the most valuable and successful assets of a city or an economy – the airports. Airports connect people. They create jobs, enable trade, spur economic growth and stimulate cultural exchanges. No less important, they bring global leaders, such as yourselves, to us. Airports bring people together. They reduce the world to the size of a global village. Take Hong Kong International Airport. Now 21 years old, the world-class facility at Chek Lap Kok has helped shape Hong Kong into the global financial services and trade centre it is today. Last year, the airport achieved record-breaking performance by handling more than 74 million passengers and over five million tonnes of cargo and air mail. More than 120 airlines operate some 1 100 flights a day, connecting Hong Kong to more than 220 destinations around the world. Nowadays, one of my headaches while meeting senior officials in overseas or in the Mainland is to meet their aspirations for more direct flights with Hong Kong, which normally I could not entertain because of the capacity constraints at the Hong Kong International Airport. It's therefore no surprise that the Guangdong-Hong Kong-Macao Greater Bay Area's Outline Development Plan, promulgated last month, confirms Hong Kong's role in several key areas, from finance to trade and transport, including serving as the Greater Bay Area's international aviation hub. A cluster of nine prosperous cities in Guangdong Province, together with Hong Kong and Macao, the two Special Administrative Regions, the Greater Bay Area boasts a population of some 70 million and a combined GDP of US$1.6 trillion. It is now an important national strategy to develop the Greater Bay Area into a vibrant world-class city cluster, and a quality living circle for living, working and travelling. 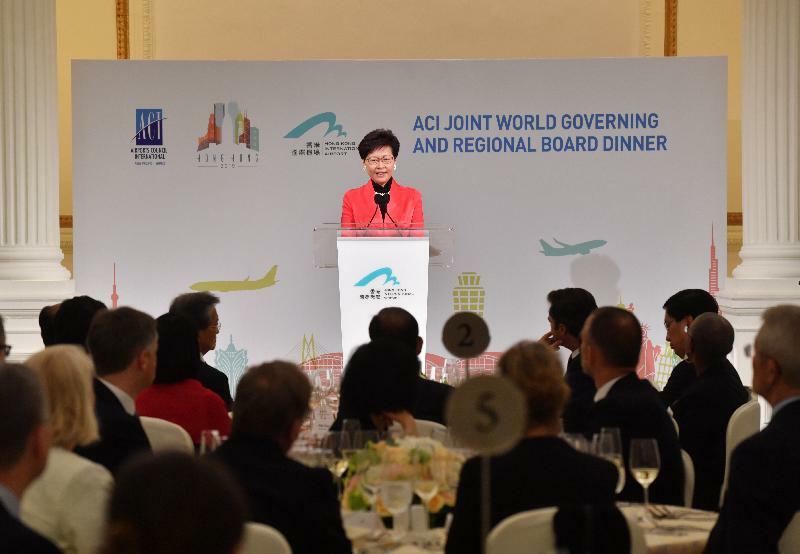 Hong Kong is committed to taking full advantage of the Greater Bay Area, and our place as its aviation hub. Our third runway is now under construction, with commissioning targeted at 2022. By 2030, we expect our airport to handle 100 million passengers and nine million tonnes of cargo annually. In short, the Hong Kong International Airport will play a critical role in carrying Hong Kong to the future, connecting us with the Greater Bay Area and the Mainland, with Asia and the world beyond. It will help us all excel. Ladies and gentlemen, it is spring in Hong Kong, our trees, shrubs and plants are full of fragrant blossoms. They colour our gardens, our country parks and waterfront parks. While this historic building, the Government House, is only open to guests and the public on particular occasions, there are indeed many historic buildings throughout Hong Kong and around us in the vicinity, which have been revitalised into interesting public places, such as Tai Kwun, the Police Married Quarters and the news museum, all within a five-minute drive from here. I invite you all to discover them during your stay in Hong Kong, Asia's world city. Please enjoy this very special evening. Thank you very much.